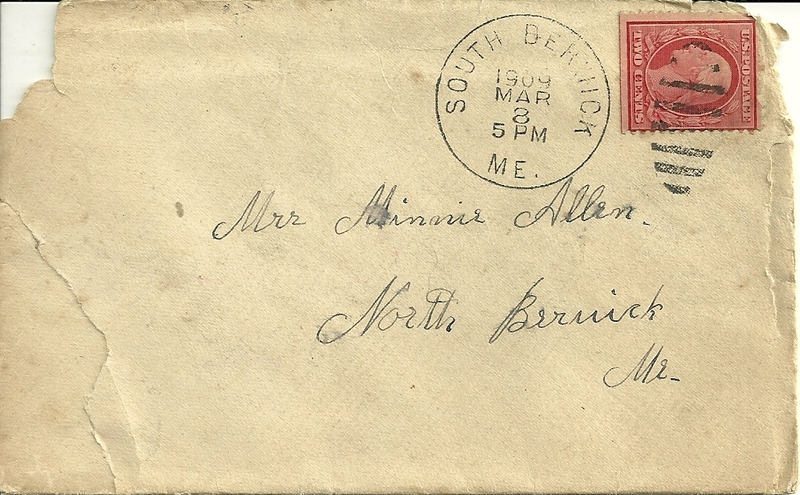 1909 letter from "Mother" to "Mrs. Minnie Allen, North Berwick, Maine. 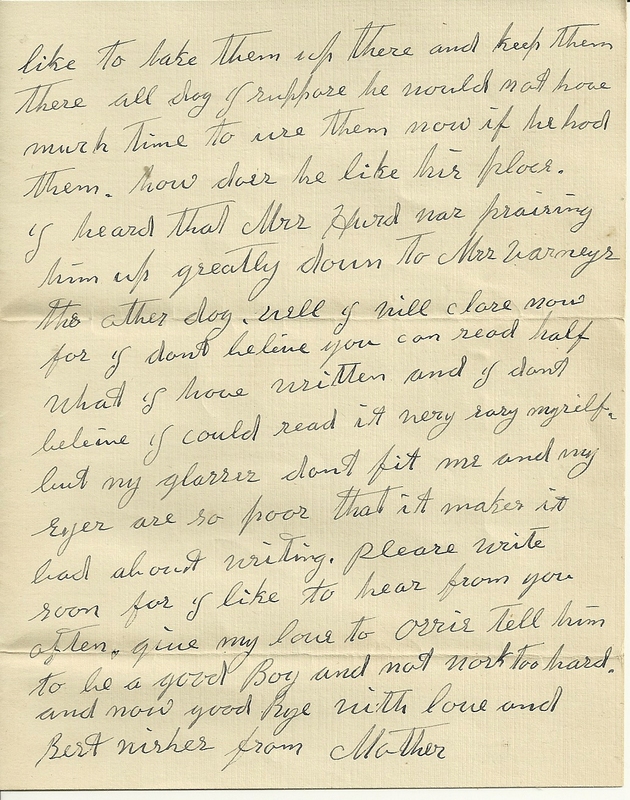 From what I've been able to determine, Minnie was Minnie F. (Hilton) Allen, who had married Orin E. Allen in 1908. You'll find a transcription a few paragraphs below. Minnie F. Hilton was born about 1881 in Wells, Maine, the daughter of George W. and Betsey Hilton. It's possible that Betsey's maiden name was Sargent. 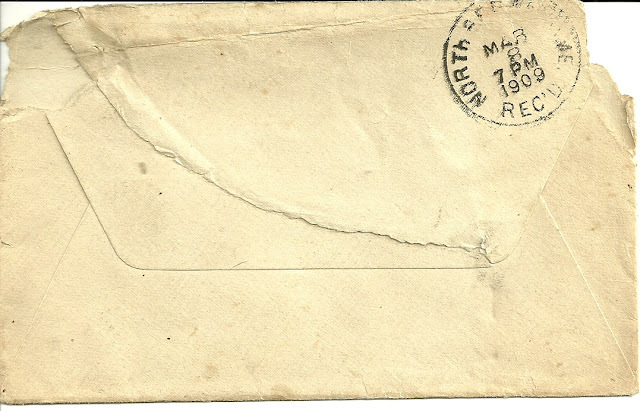 Minnie's father George was born 5 December 1841 at Wells, Maine, and died 21 March 1900 at North Berwick, Maine. Was Minnie's mother Betsey Sargent the Betsey Sargent who was born about 1845 in Maine, the daughter of Jotham and Sophia (Welch) Sargent of South Berwick, Maine? Just on the off chance, I'll mention an Eliza Sargent, daughter of James Merrill Sargent and wife Thankful Gerry. This Eliza was living with her twins brothers Sylvanus and Sylvestus in the 1900 Census of Wells, and was listed as a single woman with her birth name of Eliza Sargent. 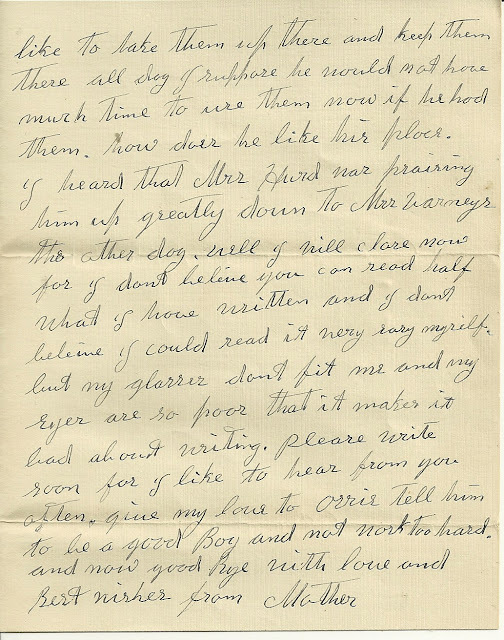 Is it possible she was Betsey (Sargent) Hilton, whose husband had recently died and she had moved in with her brothers, and the enumerator mistakenly jotted down her birth surname? Minnie married Orin E. Allen on 30 September 1908 at North Berwick, Maine. Orin was born in September of 1881 in South Berwick, the son of Orin and Elvira Jane "Elsie" (Boston) Allen. 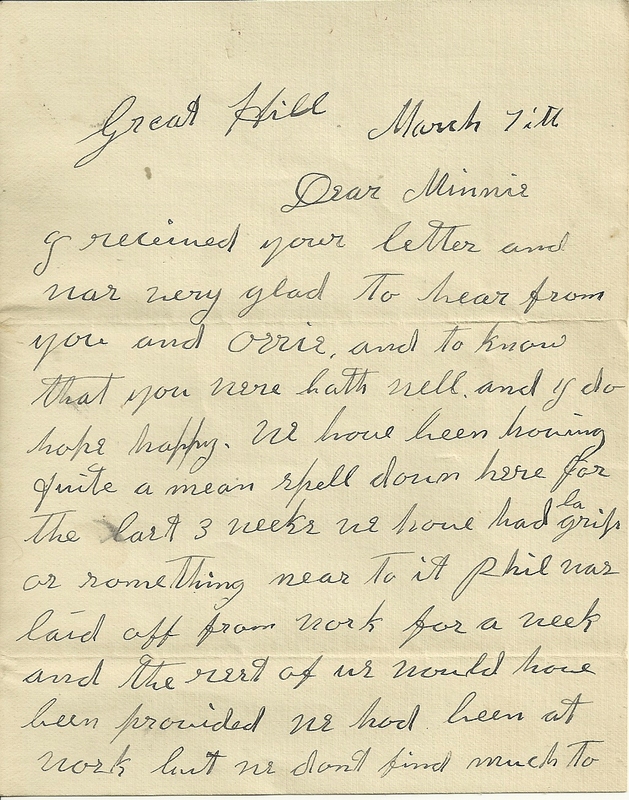 When she wrote the letter, Minnie's mother was living at "Great Hill". I assume it's the Great Hill near North Berwick, but I'm not sure. If so, here is a website with information on Great Hill, near North Berwick. 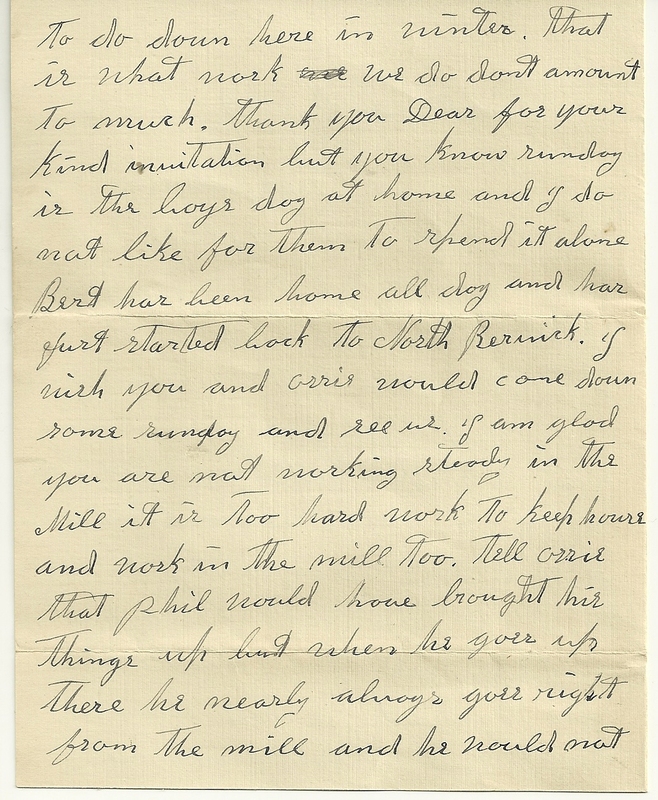 The letter references a "Phil", and I found a Philip Hilton in the area, but I'm not sure if Hilton was his surname. If you have any information to add, including corrections, please leave a comment or contact me directly. 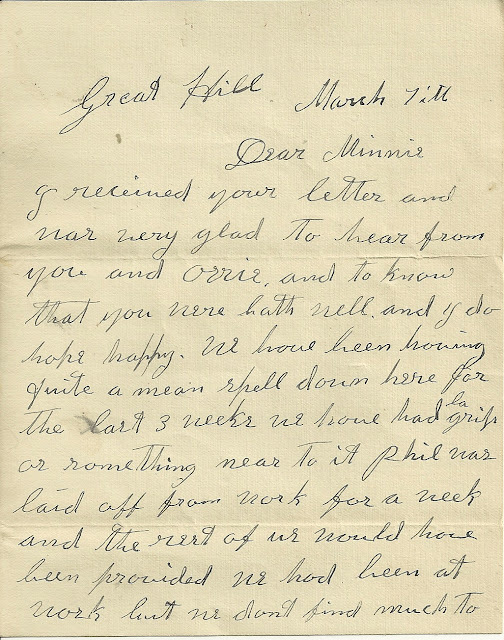 I received your letter and was very glad to hear from you and Orrie and to know that you were both well and I do hope happy. We have been having quite a mean spell down here for the last 3 weeks. We have had la grippe or something near to it. 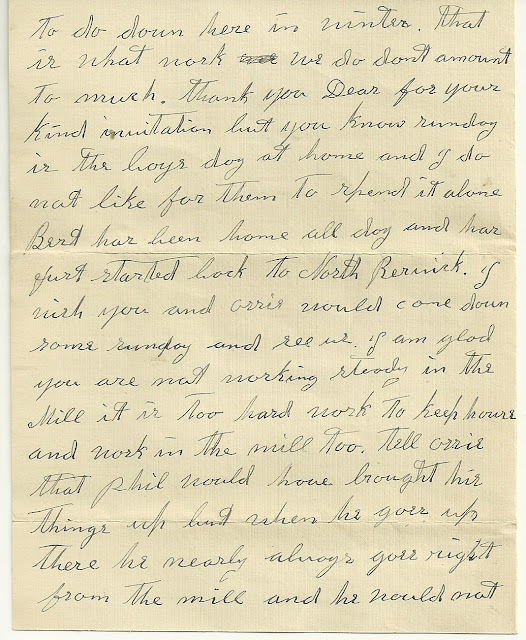 Phil was laid off from work for a week and the rest of us would have been, provided we had been at work but we don't find much to do down here in winter. That is what work we do don't amount to much. Thank you, Dear, for your kind invitation but you know Sunday is the boys' day at home and I do not like for them to spend it alone. I heard that Mrs. Hurd was praising him up greatly down to Mrs. Varney's the other day. Well, I will close now for I don't believe you can read half what I have written and I don't believe I could read it very easy myself, but my glasses don't fit me and my eyes are so poor that it makes it bad about writing. Please write soon for I like to hear from you often.